Holistic Life Coach and Global Peace Ambassador, Dr. Tatiana H. Irvin is offering a wake-up call to society. Dr. Irvin describes specific stories of clients, as well as her own personal journey, of utilizing formerly untapped brain capacity to access vast abilities in redirecting one’s course, rethinking a path, forgiving the past and living a life of gratitude and purpose. 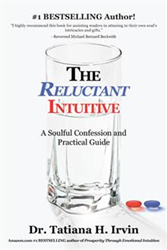 For more about “The Reluctant Intuitive,” visit: http://bookstore.balboapress.com/Products/SKU-001061424/The-Reluctant-Intuitive.aspx. Dr. Tatiana H. Irvin is the owner of Dr. Tatiana Irvin Coaching LLC. and Nurturing Hands LLC. She has a master’s degree in Metaphysics, a doctorate in Philosophy and certification in the following modalities: crystology, medical intuitive, chakra balancing, Reiki Master, Clinical Aromatherapies, Certified Permaculturist, and is a Global Peace Ambassador for the Universal Peace Federation. She is founder of Heal the Healer collaborative business model and author of Amazon #1 Best-seller “Prosperity Through Emotional Intuition.” For more: http://drtatianairvin.com/.